15 Eagle Palms must be earned in sequence, and the three-month tenure requirement must be observed for each Palm. 16 Merit Badges earned any time since joining Scouts BSA may be used to meet this requirement. The following Table shows how many and which Palms should be worn for various numbers of Merit Badges beyond the 21 required for Eagle Scout, and how long it takes to earn these palms ( assuming exactly 3 months between each Board of Review). 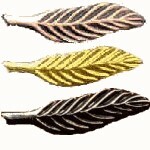 To get to the theoretical maximum of 23 Palms (7 Silver Palms and a Gold Palm), Scouts that had less than 26 merit badges at the time of their Eagle Scout Board of Review would have had to have their Eagle Board of Review before their 12th birthday, and then have each successive Board of Review at exactly 3 month intervals, and have earned all but one of the 137 current merit badges. In the table below, the 4th column shows the number of months after earning Eagle, assuming the Scout had less than 26 merit badges at that time. For each group of 5 merit badges above the minimum that the Scout had at that time, reduce the number of months shown by 3. (So for example, if the Scout had between 36 and 40 merit badges at the time of the Eagle Board of Review, the Scout could receive the first 3 Palms (i.e. his first Silver Palm) immediately, and then Palm 4 could be earned 3 months later, etc. ).